Legal Aid at Work’s 102nd anniversary celebration was held on Wednesday July 11, 2018! 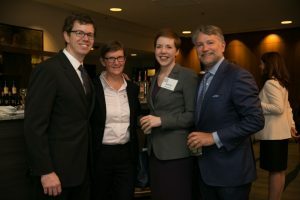 We hosted an audience of about 700 people, including attorneys from a wide spectrum of Bay Area and national firms, judges, public interest leaders and officials, and social justice activists. 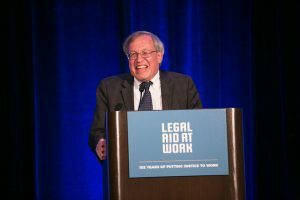 Our keynote speaker was Erwin Chemerinsky, Dean of the University of California, Berkeley, law school. A prolific author, Dean Chemerinsky is one of the thoughtful constitutional scholars of our time. In 2017, National Jurist magazine again named him as the most influential person in legal education in the United States. 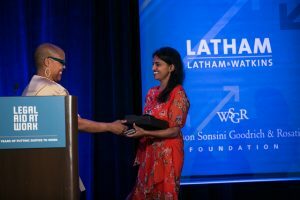 The Tobriner award was presented to Saru Jayaraman, Co-Founder and President of the Restaurant Opportunities Centers United (ROC United), which advocates for the 14 million people who work in America’s restaurant industry, and Director of the Food Labor Research Center at the University of California, Berkeley. She has been named as a “Champion of Change” by President Obama, and authored the national bestseller Behind the Kitchen Door. The award was presented by Tanya Holland, chef, cookbook author, and owner of the Oakland restaurant Brown Sugar Kitchen. Ms. Holland is a guest on NBC’s Today Show and CBS’s The Talk. She has been featured in The New York Times, Wall Street Journal, and Savoy, Travel +Leisure, Sunset, Food and Wine, and Essence magazines. Autographed “Brown Sugar Kitchen” Cookbook and dinner at Tanya Holland’s signature restaurant. Thank you to our sponsors for making this a special event! We thank the donors to our Fund-a-Need appeal!